For this post, I would like compare the live-polling tools Kahoot (https://create.kahoot.it/) and Poll Everywhere (https://www.polleverywhere.com/). The comparison is based on my experience of using the tools in information literacy workshops to gather formal and informal evidence of learning. I must stress that I have used these for very specific purposes, and have not fully explored the entire functionality of both tools – hence my ‘brief and biased’ comparison! Both Poll Everywhere and Kahoot are online platforms that allow you to create interactive activities such as quizzes and surveys that can be conducted live in a classroom setting. Users can respond using any web-enabled device. 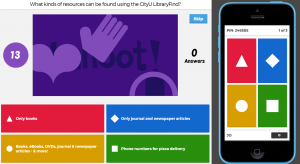 Both tools allow you to create a number of different activities, including quizzes, discussions and surveys. Each tool offers a different selection of unique activities, which will be discussed in more detail below. Kahoot is entirely free with no limitations, while Poll Everywhere has a limited free account with a number of different subscription options. The free version of Poll Everywhere is limited to only 25 users per poll. The minimum class size I teach is around 30 students, and more typically the classes sizes are 50+, meaning the free version isn’t suitable for me. The free account does not support grading. I have paid to subscribe to Poll Everywhere to get access to the full platform, and their pricing model makes it really easy to sign up for just one month or one semester – they don’t lock you into any annoying contracts. With a paid account you also get excellent personalised customer service (no trawling the online forums to troubleshoot whatever problem you might be having). 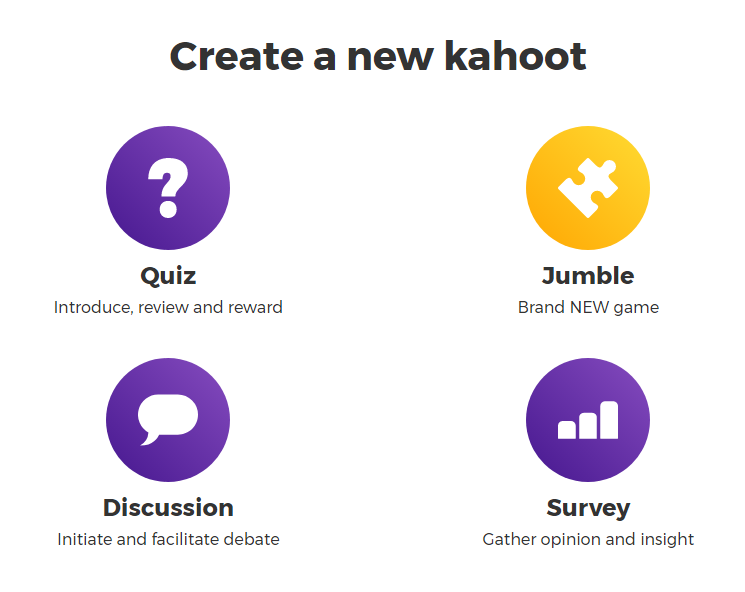 Kahoot has four types of activity: quizzes, discussions, surveys and ‘jumbles’, where users have to put items in the correct order (see Figure 1). All the activities require you to define pre-determined answers – Kahoot does not support open ended questions. 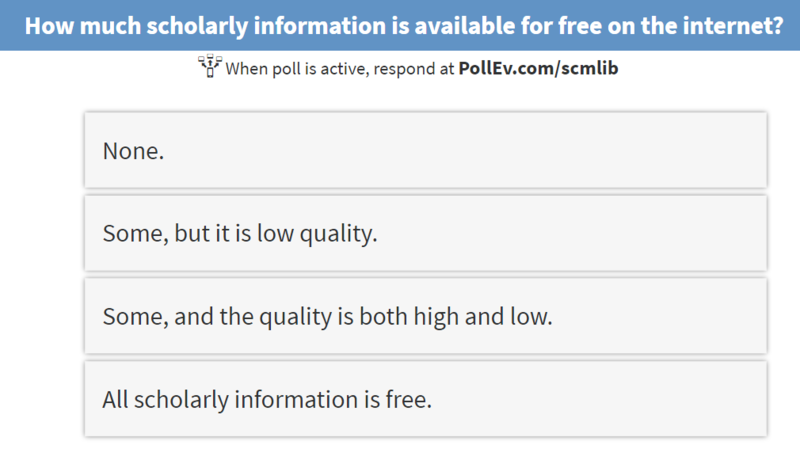 Poll Everywhere provides almost two dozen different options, including a number of activities supporting open-ended questions and the input of free text. (see Figure 2). Both platforms allow you to add images or videos either for the purpose of instruction or just to make your presentation a little more visually exciting. 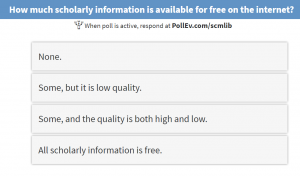 Winner: Poll Everywhere – I am yet to explore all the options but I hope to try some more next semester! If you spend half a minute to visit both the the Poll Everywhere and Kahoot homepages, you will immediately see that Kahoot has a more colourful, fun interface (see Figure 3), whereas Poll Everywhere has a more ‘austere’ look (see Figure 4). Kahoot is the more “fun” platform of the two with it’s casual use of language, inclusion of tense “game show” music and bright graphics. It does have one annoying feature that cannot be turned off: before students can participate they are required to choose a nickname which then appears on screen – which provides the opportunity for students to choose naughty names. Kahoot does allows you to ‘kick out’ and identify cheeky participants, but in my experience the problem is not so much naughty names but students having too much fun choosing their nicknames! However, I don’t begrudge a room full of giggling undergraduates, and it increases the likelihood that students are paying attention to the activity and participating. Figure 3: A preview of a Kahoot Quiz demonstrating the bright and colourful interface. Figure 4: The more ‘austere’ interface of Poll Everywhere. A word on the “game show” music: you can of course just turn the volume off, which I usually do, but I have had one professor ask me to turn it up because she likes the way it grabs the students attention! Both tools take some getting used to if you have never used live polling before, and with either platform I would recommend practicing your quizzes or polls a few times with yourself as a participant. If I were to recommend one tool over the other for ease of use if would have to be Kahoot based on its overall simplicity. The sheer number of options and granularity in creating live polls in Poll Everywhere may seem a little overwhelming to someone who has never created a live poll before. Starting with Kahoot you will learn the basics of live polling, and from there you can ‘graduate’ to Poll Everywhere if you are ready for the more advanced features. Which live-polling team reigns supreme? In my experience: it depends! My personal preference is Poll Everywhere thanks to the variety of activities, level of control over granular details of your activities and their excellent customer service. I feel paying for an account (and the fact that it is easy to ‘turn off’ your subscription) is good value for money. The free version of Poll Everywhere might work for you if you have small class sizes and no need to grade incoming answers. I do find Kahoot works quite well with undergraduate students, especially in an English as Second Language (ESL) context. If you looking for something light-hearted and easy to use, and you have no need to for students to answer open-ended questions, Kahoot might be the tool for you. What I can say in conclusion is that if you haven’t already tried these tools (or other live-polling platforms) I would highly recommend you give them a go. I have received positive feedback from both students and professors, and they have improved my ability to do both informal and formal assessment even in a short time frame. Ultimately I have found live polling tools energise my teaching, making instruction more engaging for students – and more fun for me! This entry was posted in Adjunct Member and tagged comparison, Kahoot, library instruction, live polling tools, Poll Everywhere by vew908. Bookmark the permalink.